Payment Terms are the foundation that you can set up within your account to charge your clients in separate increments, such as deposits, down payments and balances. These terms are set up based on taking payments a certain number of days before an event occurs e.g. A 10% deposit 90 days out from when the event is to occur. Default payment terms can be set up per venue so you do not have to constantly set them up whenever generating invoices for quotes and bookings if they remain the same. Multiple payment terms can be added into your venue so you can select one relevant to the type of Package or Event Type that the booking or quote is for. 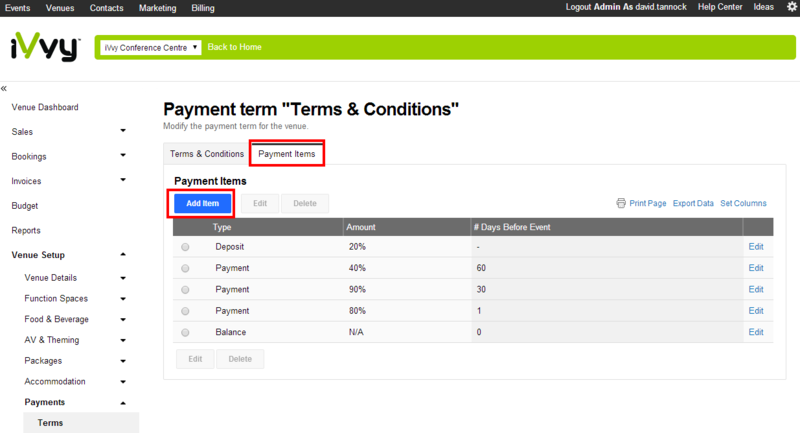 Give your term a name and a description and decide whether its a default payment option and save. 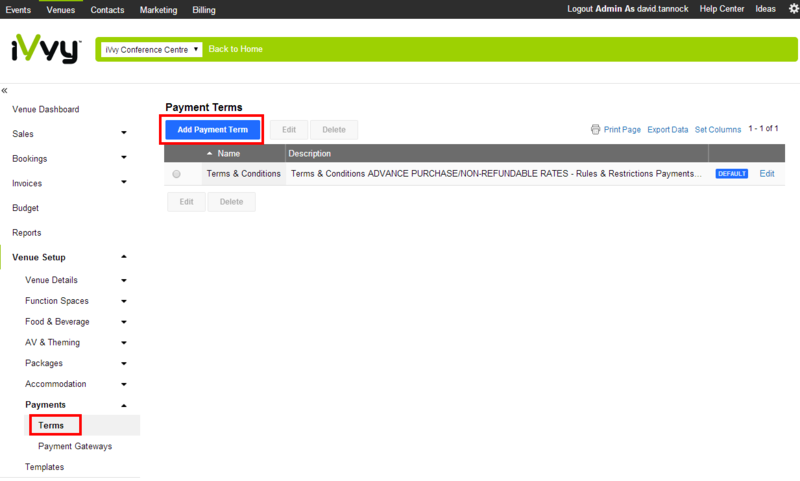 The dialog box will have closed so now you need to edit the payment term and you will notice across the top a payment terms tab. Select it. Click “Add Item”. You will notice that you have various item types for this payment term. You can add more than one. Usually you will have a deposit, a down payment then a balance. Add the appropriate “item type” and then select if its a dollar amount or a percentage and how far out that it is necessary from the date of the event. Note: When generating an invoice, due to the days before the event when you click add invoice in the invoice section it will put the dates beside when that item type is due. Repeat the process for each item type you want to apply to this payment term. If you wish to have multiple payment terms you can return to the payments section and add a fresh term and repeat the above process over again. Can I create an adhoc invoice for a booking?